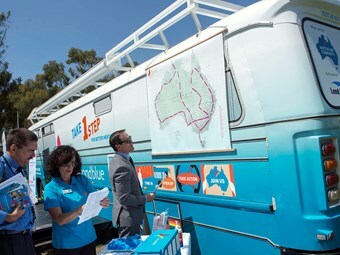 The Beyondblue National Roadshow bus is already making tracks around Australia, and will be setting up shop in South Australia this week. The not-for-profit organisation aims to increase the awareness of depression and anxiety in Australia, and the National Roadshow will travel around regional towns for 16 months in total. Program Leader Nadine Bartholomeusz-Raymond says Australia is a vast area with great distances between towns, and many don’t have access to the same services as the city. "Beyondblue made the decision that it was time for us to go out and review our relationship with the public," she says. "It was really important for us to get our message out there." Bartholomeusz-Raymond says the show has been well received by public so far. "It’s there to basically make the public more aware of what depression and anxiety is and what people can do to support themselves." The roadshow travelled to South Australia on Monday [March 17], and has already visited Tasmania and Australia Capital Territory. Nadine Bartholomeusz-Raymond says the bus has been acquired from a Melbourne couple after hearing about the organisations plans for the roadshow on radio. "The basically put a call into Beyondblue that they had an old school that they thought we could utilize for some time." She says the roadshow would not have been possible without the ongoing support of bus industry identity Scott Grenda. "Scott has been instrumental to us acquiring a bus," she says. As part of the roadshow, the bus is set up in a public place so the community can some in and have a "chat" about mental health and support.